Ooooh, Xena. Love her. She was my hero growing so when I got the chance to read this I jumped at the opportunity to give it a go. The art is really good. 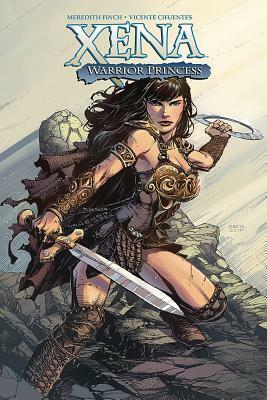 I loved how Xena and especially her costume seemed to be very influenced by Wonderwoman. It makes sense and I loved the art. It was done well. The characters have similar looks to the original show, but I was happy that the artist decided to put her own spin on the characters. The story begins at the beginning with Xena on the road where she meets Gabrielle. She saves Gabrielle from some bandits and allows her to join her. It was good to start. It has been so long I cannot remember how the show started but I think it was similar. I honestly wished we didn't have to deal with Gabrielle. She is so annoying. Or, I wish, had her show up later. I would've liked some character building with Xena without Gabrielle running amok and getting in trouble. Overall, this was good. I enjoyed the art and this interpretation. I wouldn't mind some more! I'll give this 3 stars. I had the biggest crush on Ares! Oh my goodness! ME TOO! Love Xena! I miss that show. I will have to hunt this one down. The cover art looks great. Sophia, you must! It is on Netgalley...you could request! Anna, the art is lovely! vvb32, yesss the art is good.